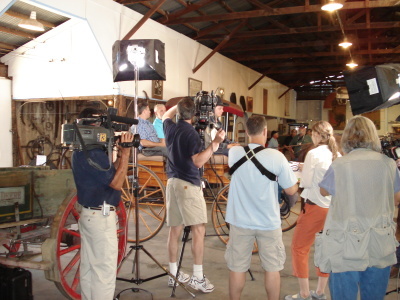 We accepted the Roadshow offer to film our Museum as a part of its 2007 programming. 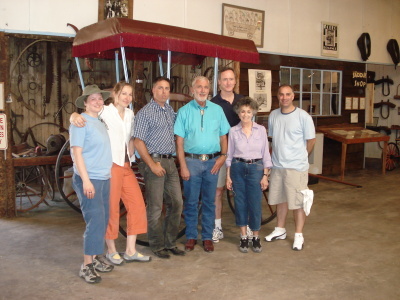 They’d arranged for an appraiser to place values on a number of our carriages and wagons, and set up to film on a very warm (100F.) day in June. The filming lasted for nearly seven hours, due in part to delays caused by airplanes from Davis-Monthan Airbase flying over our buildings during some of the ‘takes’. The following photos depict the actual shooting, with comments. Setting up to film the opening scene. Director Ines Hoffman, white shirt, orange pants, and part of a crew of 7, including host Mark Wahlberg. 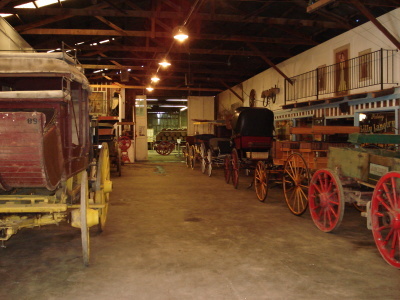 Carriages & wagons lined up along Main Street in museum. The flexibility of the museum layout lent itself to this rearrangement. After a long, hot day, there was some down time, and Bernice Anderson had an opportunity to chat with Mark Wahlberg. The show was first broadcast in February, 2007, and has been repeated many times, worldwide, since then. Thank you to the Antiques Roadshow. 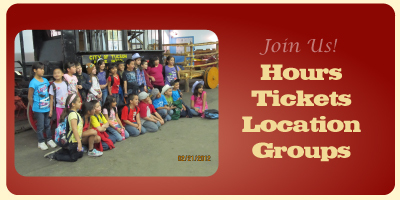 The Museum was shown alongside a few additional local businesses of Southern Arizona.